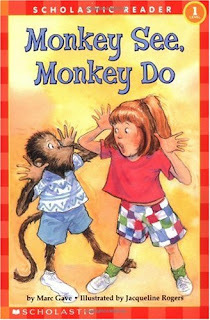 The English Schoolhouse: We Don't Monkey Around at Summer Camp...Ok, Ok--Yes We Do! We Don't Monkey Around at Summer Camp...Ok, Ok--Yes We Do! This morning, like every morning, I used a statistically proven method of random selection to choose three lucky Summer Camp kids to pick a song for us to sing aloud--Eenie meenie miney mo. 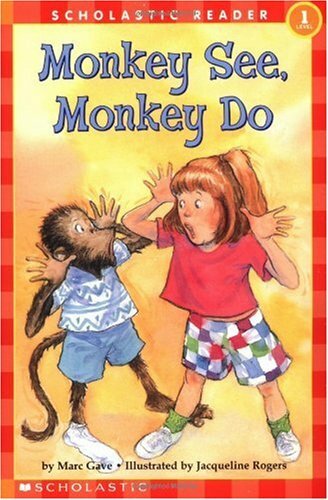 aside from that, the book I'd chosen to start the morning off was Monkey See, Monkey Do..
Then I did something that makes all real teachers feel fantastic when they're able to do it and they know it's all gonna go over well--I veered away from the lesson plan. and acted out 5 little monkeys AND Monkey See Monkey Do. A lil' monkeying around never hurt anyone.